Unable to connect my printer to my devices. My HP wireless printer (Envy 5530) is no longer working. IPad and IPhone no longer can find the printer. I have shut down all devices and followed suggested steps but no luck. All devices are connected to the same wireless and IS numbers are the same. I reviewed your post and I understand that you are having issue printing from your iPad and iPhone. I have been through all of the steps suggested. My printer blue wifi light is on, the numbers are the same on my printer,phone, and iPad. Everything was working fine and then one day it simply quit? All of my devices say "no air printers found"? Thank you for trying to help but I'm out of ideas. Follow below steps and check if it helps. Open the Embedded Web Server (EWS), and then make sure AirPrint is enabled. Print a Network Configuration page to obtain the printer IP address needed to view the EWS webpage. 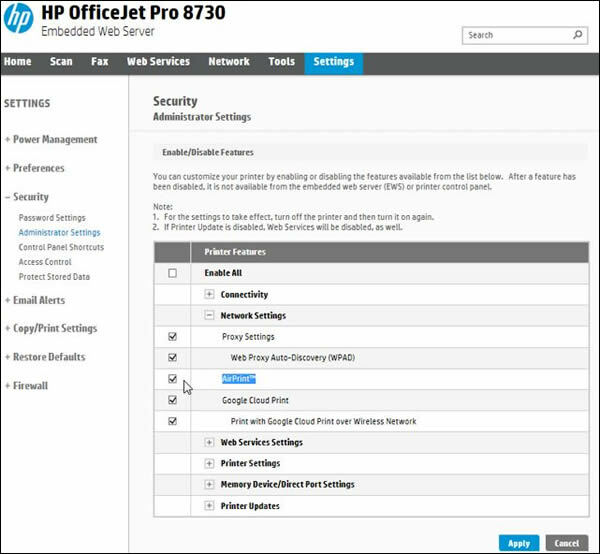 For instructions on printing a Network Configuration page, go to HP Customer Support. Type your printer model, and then search for the document to "print a configuration page." Find the printer IP address on the Network Configuration page. On your computer, open an Internet browser. Type the printer IP address in the browser address bar, and then press Enter. Make sure to type the IP address into the Internet browser's address box. If typed into a toolbar search box or search engine, the EWS does not open. If a website security certificate displays in the Internet browser, click Continue. The EWS information page for the printer opens. Click Security, and then click Administrator Settings. Under Network Settings, select AirPrint, if it is not already selected, and then click Apply.